Anna Maria’s 2018-19 proposed budget increase is an anomaly. Due to the planned construction of a new Anna Maria City Pier, the city — which will hold its first public hearing on the budget Sept. 13 — is shouldering a financial situation it’s never before faced. The contributions toward the cost of construction for the pier will spike up the city’s revenues and, in the same vein, it increases the city’s spending plan. Total revenue is projected to rise from $6,365,747.08 in 2017-18 to $10,836,547.70 in 2018-19 — an increase of $4,470,800.62. The revenue projection includes $3,828,865.80 for the pier, including an unsecured $1,370,000 from the Federal Emergency Management Agency and $500,000 in funding from the pier tenant. Expenses in 2018-19 are budgeted at $11,068,557.50, an increase of $4,457,453.68. Of the expenses, $3,703,865.80 is for the pier. 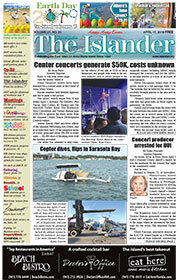 Besides the pier, Anna Maria proposes several other budget changes. Anna Maria budgeted $791,665 in intergovernmental revenue, an increase of 46 percent over this year due to a half-cent added Manatee County sales tax that renewed in 2016. The money from the tax will be used on roads, parks and other infrastructure. The city budgeted $143,000 in revenue from fines and forfeitures, an increase of 31 percent from the current year. Mayor Dan Murphy based the estimate on the addition of two sheriff’s deputies, who have been effective in assessing fines and tickets. Wages for commissioners and the mayor remain the same in the proposed budget, but some city employees will receive raises. Administrative salaries and wages will increase from $271,548.12 to $281,337.98 to pay for a new part-time position and raises of 3 percent. Public works personnel will receive a 5 percent raise, from $376,904.81 to $393,866.44. Code enforcement revenue will decrease from $566,861.38 in 2017-18 to $512,810 in 2018-19. The city budgeted an increase of $123,186 in vacation registration fees to $306,186 for 2018-19, but also budgeted a decrease of $179,212.38 in revenues from other departments to code enforcement, from $383,336.38 to $204,124. Code enforcement expenses will increase by 17 percent, from $411,808.91 in 2017-18 to $479,900 in 2018-19. The differential is due to an increase of 33 percent in wages the mayor said would be used to correct understaffing. The department lost two officers and a part-timer in the 2017-18 fiscal year. When accounting for their losses in last year’s code enforcement expenditures, the increase is only about $5,000 more than what was budgeted last year, or an increase of 3 percent. Building department expenses will increase by 18 percent, largely due to a new contingency fund of $92,410, accessible to both code enforcement and the building department. The 2017-18 expenses were $643,128.23. The 2018-19 expenses are budgeted at $760,410. Building department revenues are projected to rise by $27,900, including small increases in building permit and planning fee revenues. Code enforcement and the building department fiscally offset each other. Code enforcement is budgeted to make $32,910 in net revenue and the building department is budgeted to lose $32,910. Stormwater expenditures will increase by 44 percent, from $588,731 in 2017-18 to $845,050 in 2018-19. Murphy said the money will be used to improve stormwater drainage. The city budgeted an increase of $119,199 in stormwater revenue, added $75,000 to stormwater reserves and carried over $97,877 into 2018-19. Expenses for city roads will increase by 49 percent, partly due to $150,000 to repair the North Bay Boulevard and Crescent Avenue bridges and $61,807 for equipment, such as a new truck. The city expects to bring $129,078 in carryover for city roads into the new year, as well as $100,000 more in reserves. Stormwater revenues and expenses break even at $845,050. Road revenues and expenses break even at $643,145. The contingency fund will increase by 97 percent, from $422,002.98 to $830,103.76. The tentative millage rate of 2.05 for the 2018-19 fiscal year amounts to a tax increase for property owners. The current ad valorem rate of 2.05 yielded $2,037,798 for the 2017-18 fiscal year. If commissioners keep the millage rate the same, at 2.05 for 2018-19, estimates project a $2,245,437 yield — a $207,639 increase that will be paid by property owners. Murphy said if there are excess funds going into the new fiscal year, the city could instead go with the proposed rollback rate of 1.8911. The rollback rate would yield ad valorum revenues of $2,071,388. To avoid raising property taxes, the city would need to adopt the rollback rate, the millage needed to produce the same revenue as the current budget year. The millage rate is the amount per $1,000 of property value used to calculate property taxes. The owner of a property appraised at $400,000 with a 2.05 millage rate would pay $820 in property taxes. The owner of a property appraised at $400,000 with a 1.8911 rollback rate would pay $756.44 in property taxes. The total appraised taxable value of Anna Maria properties is $1,094,718,024, with $19,008,031 in new construction. The first public hearing for the 2018-19 budget will be at 5:30 p.m. Thursday, Sept. 13, at Anna Maria City Hall, 10005 Gulf Drive. The final public hearing and vote will be 5:30 p.m. Thursday, Sept. 27, also at city hall.